The average American family will spend $233,610 to raise a child through age 17, according to data from the US Department of Agriculture. But that figure can fluctuate — becoming more or less affordable — when you consider cost of living and wages in different parts of the US. The states where raising a child is most affordable are in the Northeast, according to a report by Credit Loan. Between food, childcare, healthcare, transportation, and education costs, the average two-parent family in the US will spend a total of $233,610 to raise a child from birth through age 17, according to data from the US Department of Agriculture. Students use a wooden boat to cross the Bengawan Solo river to attend school in Bojonegoro, East Java province, April 7, 2015, in this picture taken by Antara Foto. REUTERS/Aguk Sudarmojo/Antara Foto ATTENTION EDITORS - THIS PICTURE WAS PROVIDED BY A THIRD PARTY. THIS PICTURE IS DISTRIBUTED EXACTLY AS RECEIVED BY REUTERS, AS A SERVICE TO CLIENTS. FOR EDITORIAL USE ONLY. NOT FOR SALE FOR MARKETING OR ADVERTISING CAMPAIGNS. MANDATORY CREDIT. INDONESIA OUT. NO COMMERCIAL OR EDITORIAL SALES IN INDONESIA. A student from "the cliff village" in Atule'er climbs newly-constructed steel ladders after school to go home for holidays, in Liangshan Sichuan province, China, November 19, 2016. The steel ladders which replaced the unsafe vine ladders shortened the time taken for the children to go home, from three hours to two. Picture taken November 19, 2016. REUTERS/Stringer ATTENTION EDITORS - THIS IMAGE WAS PROVIDED BY A THIRD PARTY. EDITORIAL USE ONLY. CHINA OUT. NO COMMERCIAL OR EDITORIAL SALES IN CHINA. Using MIT's Living Wage calculator, personal finance guide Credit Loan found the average expenses in each state for a one-parent, one-child household as well as a two-parent, one-child household. After calculating the average of those numbers, Credit Loan compared it to the U.S. Census Bureau's median income for each state to determine how much of a household's budget is spent on child-related costs. Housing accounts for a third of the total estimated cost of raising kids, while food, childcare, and education costs make up another third of the overall budget, according to the US Department of Agriculture. 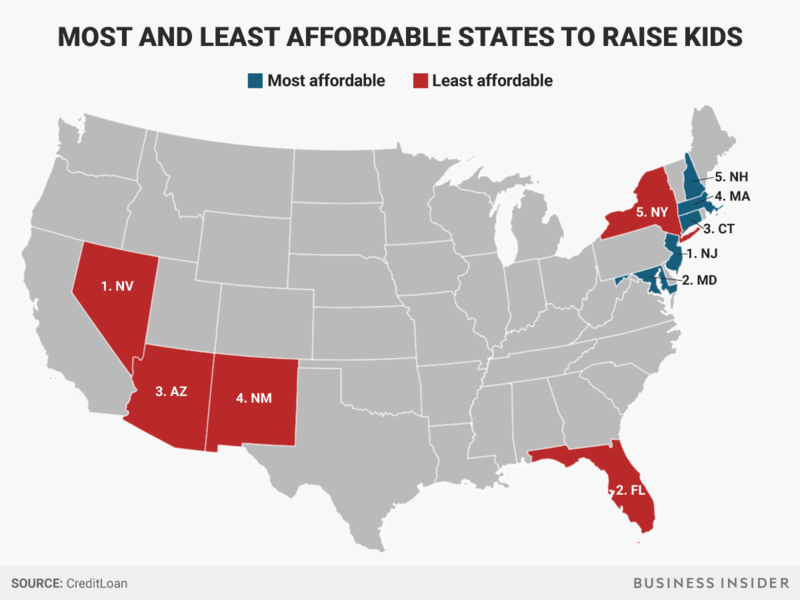 The map below shows the five states where it's most affordable to raise kids — and the five states where it's least affordable. In New Jersey, Maryland, and Connecticut parents can expect to put less than 60% of their total income into child-related costs. By contrast, in Nevada, Florida, and Arizona, the least affordable states to have children, child-related costs will eat up more than 80% of the household income. The cost associated with raising children is also affected by how many kids you have and whether you're a single parent or a two-parent household. Couples tend to earn more and, as a result, spend more on their children,according to Credit Loan's analysis.